Place the lentils and 900ml/1¾ pints of the water into a pan, stir well and bring to the boil. Skim off any froth that forms on the surface of the water with a spoon. Cover the pan with a lid and reduce the heat to a simmer. Simmer, stirring regularly, for 35-40 minutes, or until the lentils are just tender, adding more water as necessary. Set the lentils aside to thicken and cool. Add the onion, chillies and ginger and fry for 4-5 minutes, or until golden-brown. Blend the garlic and tomatoes to a purée in a food processor. Add the purée to the pan and stir well to combine. 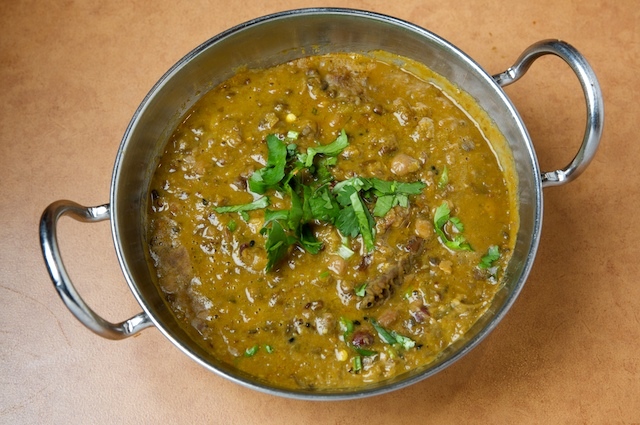 Add the cooked lentils to the sauce and stir well, adding more water as necessary to loosen the mixture. Bring the mixture to the boil and season, to taste, with salt and freshly ground black pepper. Stir in the chopped coriander just before serving.